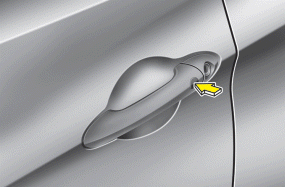 Pressing the button of the front outside door handles with all doors closed and any door unlock, locks all the doors. If all doors, trunk and engine hood are closed, the hazard warning lights will blink and the chime will sound once to indicate that all doors are locked. However, if any door remains open, the doors won't lock and the chime will sound for 3 seconds. Close the door and try again to lock the doors. If trunk lid or engine hood remains open, the hazard warning light and chime won't operate. After this, trunk lid and engine hood are closed, the hazard warning lights blink once. If you want to make sure that a door has locked or not, you should check the door lock button inside the vehicle or pull the outside door handle. The ignition switch is in ACC or ON position. All doors are locked if the lock button(1) is pressed. If all doors, trunk and hood are closed, the hazard warning lights will blink and the chime will sound once to indicate that all doors are locked. However, if any door, trunk or engine hood remains open, the hazard warning lights and the chime will not operate. If all doors, trunk and engine hood are closed after the lock button is pressed, the hazard warning lights blink. 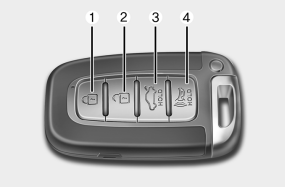 The trunk is opened if the trunk unlock button(3) is pressed for more than 1 second. Once the trunk is opened and then closed, the trunk will lock automatically.